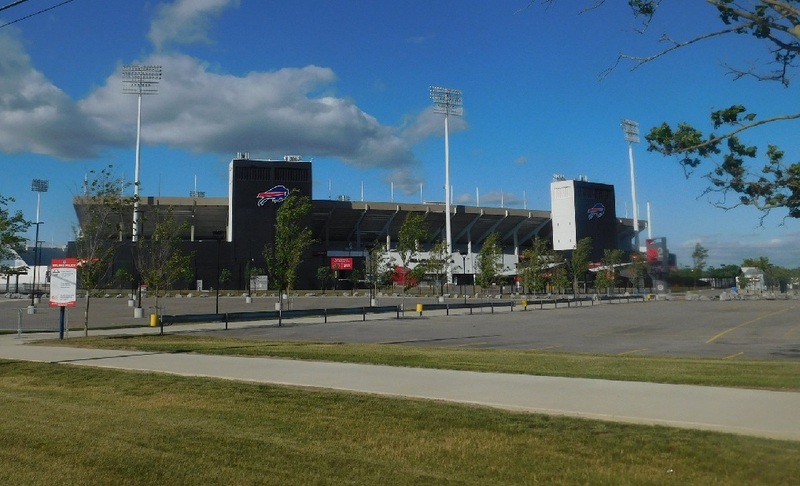 While it may be the newest and fanciest stadium in the NFL, on Sundays during the Fall, the Town of Orchard Park comes alive as Bills fans invade the town for football at New Era Field. The Bills history in upstate New York dates to 1959 when Ralph Wilson was awarded an expansion AFL football team that began playing in 1960 at War Memorial Stadium in Buffalo. War Memorial Stadium, a 47,000 seat stadium built in the 1930s, was constructed to host numerous events. When the Bills became a part of the NFL in 1970, it was apparent that a larger stadium was needed for the team. 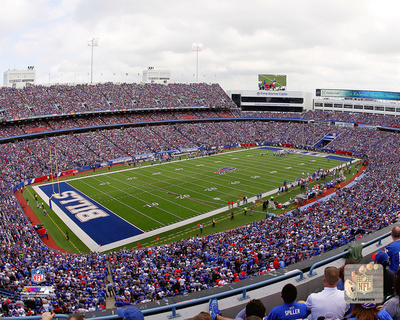 Owner Ralph Wilson sought a new dome stadium in Buffalo but was unable to gain support. Wilson met with officials in Seattle about the possibility of moving the team there, but instead he reached an agreement to build a stadium on a 130 acre tract of land in Orchard Park, a town south of Buffalo. Once the stadium was completed in 1973, Rich Foods bought the naming rights to the stadium for $1.5 million a year, for 25 years. The Bills became one of the first teams ever to sell the naming rights to their stadium. It was known as Rich Stadium until 1998, when the stadium was renamed Ralph Wilson Stadium. O.J. Simpson sets new NFL record in 1975 scoring 23 touchdowns and rushing for 1,817 yards. Thurman Thomas wins NFL MVP and Offensive Player of the Year in 1991. The Buffalo Bills christened the stadium on August 17, 1973. It originally had a seating capacity of over 80,000, consisting of three decks of blue and red seats. The lower and second levels of seats circle the entire Fieldturf playing field. 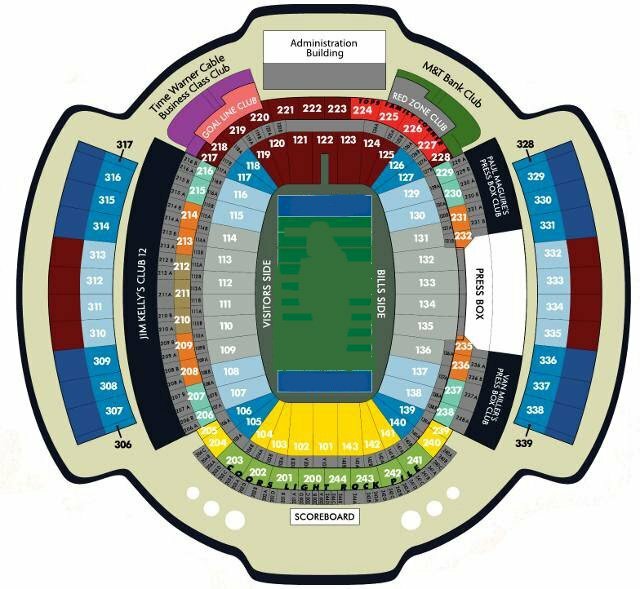 An upper level of seats are located on both sides of the playing field. The playing field is located 50 feet below ground level, eliminating long walks to the upper deck. Through its history, the stadium has underwent many changes over the years. In 1984, the stadium’s capacity was increased to 80,290 with the addition of 16 executive suites, and in 1992, 24 more executive suites were added. More additions were completed in 1994. The Red Zone and Goal Line clubs, that are enclosed of glass and consist of 500 seats were added along with 14 executive suites. The main addition in 1994 was a massive 31.5ft high and 41.5ft wide JumboTron video/scoreboard. In 1998 the seating capacity was reduced to just under 74,000, as new larger seats were installed. This addition also included more luxury and club seats. In 2007, a new 88ft by 32ft HD video/scoreboard was installed and replaced the old Sony Jumbotron. Electronic ribbon boards were also installed in the interior. 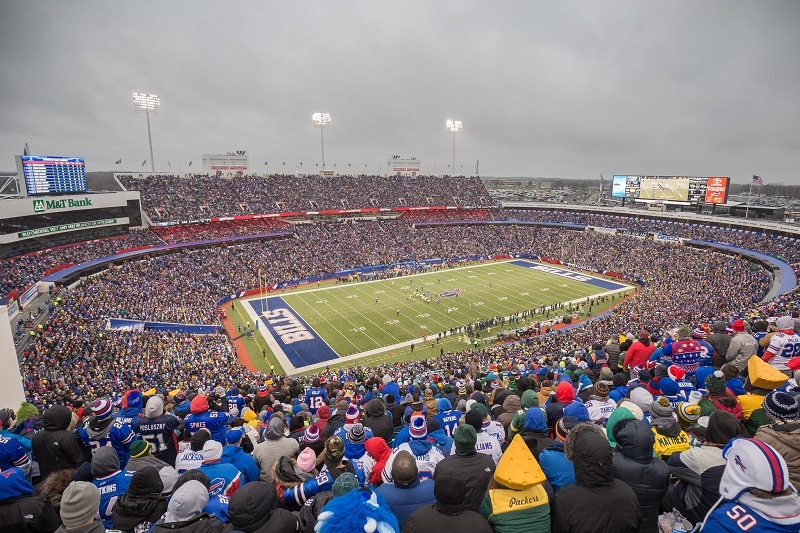 In December 2012, the Bills, the State of New York and Erie County officials agreed on a 10-year lease agreement keeping the Bills at Buffalo until 2023. The agreement includes $130 million in improvements to the stadium. Renovations included a new west size plaza, updated concessions, bathrooms, an 8,000 square foot Bills team store and a new 5,400 square foot HD video/scoreboard. This project was completed by the 2014 season. In August 2016 the Bills sold the naming rights to Ralph Wilson Stadium to New Era Cap Company. This seven year contract changes the name to New Era Field. -Naming Rights: New Era Cap Co.